When it comes to kneeling chairs, your selection choice is huge. Trying to find one that will suit your sitting style and posture can be tricky. To help you out though we’ve taken a look at the Sleekform Ergonomic Kneeling Chair. It’s a metal framed, height adjustable stool for home or office use. From first impressions, the Sleekform appears to be a solid, well-made chair. The frame is made of two sections of welded tubular metal, and is joined at its pivot point by two strong metal bolts. Four fully rotational caster wheels provide easy movement while seated, with two of the wheels featuring a locking mechanism, meaning you have the option to prevent the chair from rolling. The product arrives disassembled in a flat box, 6.5 inches high, and 26 inches long by 23 inches wide. It is easy to assemble with simple bolt connections to attach the seat and knee rest to the steel frame. The frame is coated in a black powder coat which is neat and modern. The seat’s height can be adjusted by twisting the screw mechanism that causes the frame to scissor up and down. The seat is easy to adjust when not seated, but when your weight rests on the mechanism it locks it in place, ensuring it doesn’t alter. 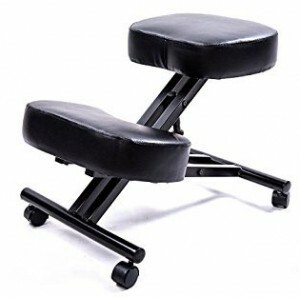 The simple mechanism provides a lowest seat position 21 inches above ground, going all the way up to 28 inches. The chair is designed to accommodate people that weigh up to 250 pounds. The Sleekform e rgonomic kneeling chair’s large adjustment range is one of its key features. The 7 inches of adjustment means it is suitable for people of largely differing heights, and also means the chair can be used at desks of various heights. You’ll see many other chairs that advertise large cushions, but few take it to the extreme that Sleekform have. Their kneeling chair has twice as much cushion as the average of their competitor’s chairs. This extra cushion is located in both the knee rest and the seat and is manufactured from 100% recycled foam. If you need to transport the chair, or store it somewhere, the screw mechanism can be removed, allowing the chair to lie flat, but this can take a bit of effort, so is not something you’d want to do every day. Sleekform have put together a seriously competitive product with their ergonomic kneeling chair. The solid metal design is sure to last, and with the extra thick padding, you don’t have to worry about the chair becoming uncomfortable after a few years of use, regardless of your weight. Added to that the large amount of flexibility the design allows from a height perspective, you’ll battle to find a desk or person to use the chair who can’t fit on it comfortably. One thing to keep in mind is the relatively flat upper seat. This is not a problem, but some people do prefer a more angled surface to rest on, this would be a matter of personal taste though. Although some may opt for a cheaper alternative, for the price difference between the Sleekform and its competition, we feel the Sleekform provides far more value, and will last much longer.